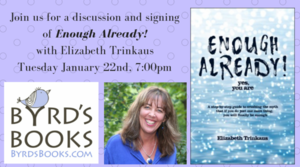 Byrd's Books will host a discussion and signing with Elizabeth Trinkaus, author of on Enough Already! Yes, You Are: A Step-By-Step Guide to Crushing the Myth That If You Do Just One More Thing, You Will Finally Be Enough. The event will be held on Tuesday Jan. 22 at 7 p.m. Click here to register. About the Book: Trinkaus offers real-life solutions for you to get who you really are separate from what you have and do and provides step-by-step tools to help you live in the powerful present. Best of all: Enough Already! will have you living with more joy and satisfaction now, and will bring more creativity and inspiration to all those important dreams. So grab a comfy seat . . . this book is in your hands for a reason. About the author: Trinkaus is the owner of Pinnacle View, a life-enrichment company. She is a speaker, author, and coach who has been inspiring audiences around the globe for over 25 years. She is a certified trainer for the Canfield Success Principles, Louise Hay Heal Your Life , and her writing has been included in collections authored by Deepak Chopra and Stephen Covey. Trinkaus resides in Chapel Hill, NC, with her life squeeze, Greg, and their two rescue pups. You can reach her at enough.rocks. Byrd's Books is located at 178 Greenwood Avenue in Bethel, Conn. For more information, visit byrdsbooks.com or call (203) 730 BYRD (2973).